A recent USDA report reveals that nearly 18 million families, or 49 million people, lacked “food security” which is defined as “consistent, dependable access to enough food for active, healthy living.” Food insecurity is a polite term for starvation. Since 1995, the percent starving in the US hovered at or below 12%. That changed in 2008 when it jumped to 14.6%, and has stayed above 14% since then. In 2012, the percentage was 14.5%, or one in seven people. Only 59% of those counted as “food insecure” used any of the three major federal food assistance programs, researchers found. They looked at Supplemental Nutrition Assistance Program (food stamps); Special Supplemental Nutrition Program for Women, Infants, and Children (WIC); and the National School Lunch Program. Though food stamps provide an average of $1.33 per meal for its recipients, Republicrats plan to cut $40 billion over ten years from this essential social service, Think Progress reports. People get nasty when hungry; and many sociologists and historians point to widespread hunger as the cause of most, if not all, major revolutions in world history. Even recent ones. The Romans understood this, ergo the saying, panem et circenses (give the masses ‘bread and circuses’ to appease them and thus retain control). Despite that one out of seven US citizens goes hungry, Obama, like his predecessors, continues to pour hundreds of billions of dollars into the war machine. 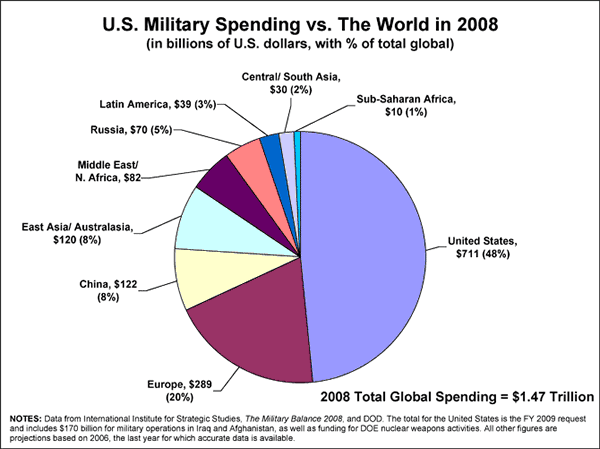 At last count, the US spent $684 billion in 2012, or 39% of the total global defense spending, reports Global Issues. US military spending is down from 2008, when it spent $711 billion, if sources are accurate. The World Food Programme of the United Nations estimates the global hunger rate at one in eight. Under these circumstances, no US president has any business worrying about hunger over there. But that he is, at least superficially. In reality, “Feed the Future” is merely a scheme to blanket the planet in genetically modified food and toxic chemicals. Obama’s concern about homegrown poverty, as we see from bankster bailouts and never-ending war, is nonexistent. He certainly hasn’t bucked long-time federal policy of legalizing slavery under the name minimum wage. No adult can support herself on minimum wage. Hunger is guaranteed under minimum wage. Obama’s FDA, run by former Monsanto executives, has a peculiar interest in destroying small farming operations in this nation. Nutritious food, grown organically and raised humanely, has been the target of several federally directed raids, supported by local sheriffs and police. No one has been sickened by food sold by these farms, or in the private buying clubs (like Rawsome Foods) that distribute it. But that’s not the point. Instead, the federal government clearly seeks to eliminate giant agribiz competition. The current war on small US farmers is detailed in David Gumpert’s two books, The Raw Milk Revolution: Behind America’s Emerging Battle Over Food Rights (2009), and Life, Liberty and the Pursuit of Food Rights (2013). On the state level, we continue to find news items where children’s lemonade and raspberry stands are being shut down, for failure to acquire a permit. At the city level, feeding the homeless, a time-honored act of charity, has been criminalized across the US. Even fundraising bake sales have been criminalized. Ron Finley, a self-admitted “gangsta gardener” faced a $400 fine for growing free-for-the-taking vegetables on his tree lawn. “Data from the U.S. National Poison Data System’s annual report, which tracked data from 57 U.S. poison centers, showed vitamin and mineral supplements caused zero deaths in 2010, whereas pharmaceuticals caused more than 1,100 of the total 1,366 reported fatalities. FDA-approved drugs cause 80 percent of poison control fatalities each year. Poison control centers report 100,000 calls, 56,000 emergency room visits, 2,600 hospitalizations and nearly 500 deaths each year from acetaminophen (Tylenol) alone. The Dietary Supplement Health and Education Act of 1994 (DSHEA), among other laws, already controls supplements. Instead of enabling enhanced nutrition of its citizens, the feds concern themselves with increasing pharmaceutical profits. The same can be said for other nations. In 2011, legislation introduced in Australia sought to ban thousands of plants, including its national flower, because they contain DMT, a naturally-occurring hallucinogen that even the human brain produces. Though rarely considered in food criminalization discussions, not only does marijuana have medicinal and recreational benefits, but its “seeds contain essential fatty acids and amino acids, which can be baked into foods to boost their nutritional value, in seed oil when sauteing foods, or taken as a supplement,” report Fox, Armentano and Tvert in Marijuana Is Safer So Why Are We Driving People to Drink? Marijuana Is Safer details numerous medical benefits including anti-carcinogenic properties, preventing epileptic seizures, reducing peripheral neuropathy pain along with other types of pain, and thus reduces opiate dosage needs. It increases craving for food, a boon for those on appetite-suppressing chemotherapy, and it promotes sleepiness. “In some cases, it appears that marijuana can effectively treat disease itself. For instance, marijuana possesses strong antioxidant properties that can protect the brain during trauma and potentially ward off the onset of certain neurological diseases such as Alzheimers. That patent was filed back in 1999, deep amid the war on drugs. Genetically modified marijuana research has been ongoing for over two decades, detailed by numerous freelance researchers. Several insist that a former agent for the Drug Enforcement Agency, Sam Selezny (aka David Watson aka Skunkman) developed his strains of GM weed in Holland with funding from the DEA. His company, Hortapharm, stands to make billions when pot is fully legalized in the States. Just as natural, unmodified fresh milk is a market threat to drug-laden, industrial milk; natural, privately grown marijuana is a threat to the GM weed market. And so we see legal marijuana suffering under Obama. Last month, however, we saw some key changes in federal policy. Attorney General Eric Holder announced a “compassionate release” program to let medical marijuana users out of prison. Next, the Dept. of Justice reversed itself by agreeing to allow banks to work with medical marijuana clinics, and agreed to abide by voter decision in Washington and Colorado which allows for recreational use. Finally, we cannot discuss starvation without mentioning food commodities. The dissolution of trade barriers and deregulation of the banking sector has led to price manipulation, increasing food insecurity and causing widespread starvation. “[T]he European Union finally agreed in 1993 to the GATT Uruguay Round, requiring a major reduction of national agriculture protection. Central to the Uruguay Round deal was agreement on one major change: national grain reserves as a government responsibility were to be ended…. “The elimination of national grain reserves in the USA and EU and other major OECD industrial countries set the stage for the next step in the process—elimination of agricultural commodity derivatives regulation, allowing unbridled unchecked speculative manipulations. “When Henry Kissinger was Secretary of State in 1972-1973, acting in league with the Department of Agriculture and major US grain trading companies, he orchestrated an unprecedented 200% jump in the price of grain. The price hike was triggered at that time by the US signing a three-year contract with the Soviet Union that had just gone through a disastrous harvest failure. “At the time, the Commodity Futures Trading Commission (CFTC) proposed also to deregulate trading in derivatives between major banks or financial institutions, including derivatives of grain and other agricultural commodities. Urban agriculture is taking off in blighted areas in Detroit, Los Angeles, and other cities. Rooftop and bus top gardens represent innovations beyond the ken of Obama and his agribuddies. They profit urbanites by providing local, healthy produce in food deserts, where fresh, nutritious food is lacking. They also provide a food cushion, should disaster strike and the local store’s 3-day food supply runs out. While peace activists the world over vocally oppose more MidEast wars, agtivists continue to battle the biotech giants whose products are genetically contaminating natural crops and destroying our pollinators and soils with their requisite toxic chemicals. A fortnight of actions for Seed and Food Freedom is planned for Oct. 2-16 around the planet. As “generals gather in their masses,” we can expect little positive aid from the feds. We can and should get local regulators on our side, so that our kids can have lemonade stands, our churches can have bake sales, and our private buying clubs or food co-ops can provide the food we want, that is much healthier for us, and that works with nature instead of against it. The real trick to reducing hunger is to decentralize the food system, to grow our own, and to buy local. This is food democracy in action, and we don’t need permission to do it.